Manchester City have signed Aston Villa goalkeeper Stuart Taylor for an undisclosed fee. Taylor, 28, has struggled for first-team football at Villa Park and made eight appearances on loan at Championship club Cardiff last season. His arrival as understudy to Shay Given will allow manager Mark Hughes to arrange a loan move out of Eastlands for England under-21 keeper Joe Hart. Taylor said: "I can't wait to start. This is a fantastic club to join." 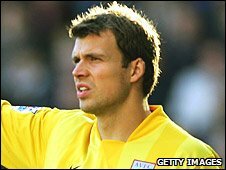 Taylor was at Villa for four years but made just 12 league appearances in that time after signing from Arsenal for £1 million in 2005. The former England under-21 international previously spent eight years with the Gunners and won a Premier League winner's medal in 2002. Taylor becomes Hughes' third signing of the summer and follows former Villa team-mate Gareth Barry to Eastlands. Hughes told City's website: "Stuart is still a fairly young goalkeeper but provides a wealth of experience and reliability." Hart is now expected to complete a season-long loan move to Birmingham City.